alanwinstanley.com Electronics : Photo : Product Design : Cycling : Consumer : Interesting stuff - Hobby Electronics - The legacy of Watford Electronics Ltd.
Back in the heady electronics hobbyist days of the 1970s and 1980s, constructors who sought mail order suppliers of components were spoilt for choice. UK hobby magazines of the era, like Practical Electronics, Practical Wireless or Everyday Electronics (all published by IPC Magazines then), were stuffed with adverts for a myriad of independents including Watford Electronics, a small firm established in 1972 to serve the electronics hobbyist. This article is a tribute to Watford Electronics’ journey from its humble beginnings to greatness. 1978 Catalogue image showing the shop at 33/35 Cardiff Road, WatfordWatford's price lists often filled magazine pages with advertising and the firm had a small shop at 33/35 Cardiff Road, Watford. Thanks to Google Street View we can now browse a decade’s worth of street scenery where we see how the original crazy-paved shop window (see 1978 catalogue) was still there in 2008 before being removed in 2009 onwards. Funny how full-page magazine adverts made suppliers look big. See https://goo.gl/maps/iDrjE8NpfNn In the latest Street View photos, if you zoom out an aerial view is adopted and outbuildings in the back yard can be seen. Perhaps they were the original Watford Electronics office or store. I am guessing that the entire Watford Electronics catalogue was probably typed and laid out by hand, possibly using an IBM golfball typewriter (I recognise the typeface) but I might be wrong. It would have been an enormous clerical and typesetting task at the time either way. Apart from retailing components, amongst other achievements Watford claimed to introduce the UK’s first TV game ‘Pong’ in 1976 and I recall a series of LSI chips produced by GI (General Instruments) for simple video games that proved a bit buggy. Notable too was Watford’s use of the new-ish Intersil 7106 chip at the heart of a new digital multimeter kit, the Watford DM900, at a time when digital test meters were pretty rare and expensive. It was state of the art stuff in the 1970s when most of us had South Korean moving coil or Russian-made moving iron multimeters, or very expensive Avo 8 multimeters. Watford Electronics also offered a kit for the Practical Wireless “Purbeck” cathode ray oscilloscope (1978) and kits for the Practical Electronics Rhythm Generator (1978). A new design for an Electronic Piano was also floated and promised for 1979 (page 64). Of huge interest to me were their Figaro TGS gas sensors (page 66), and Watford Electronics supplied numerous components for my Gas Sentinel and multichannel gas detector as featured in Everyday Electronics at the time. EE did me proud when they published those, and they were very successful amateur projects. Much of Watford’s product range was standard hobby electronics fare that typified what was on offer by mail order to customers at the time. No credit card processing existed: you filled in a form, calculated it manually and posted it off with a cheque or money order (page 2). Furthermore, there were two rates of VAT (GST), 12½% or 8% which created total bureaucratic nightmares. The firm would gradually diversify away from penny resistors when Watford caught the tide of home computing that was breaking in the 1980s. They majored on the Sinclair Spectrum, BBC and Acorn computers and all the peripherals, consumables and cables etc. that went with them. The business plan would be obvious: "added value" was a business buzz-word in the 1980s and Watford Electronics could add more value to electronics kits and products of their own (Maplin was doing the same) than selling penny components. They went on to design a memory module for the BBC home computer before launching their own 286 laptop computer. Watford Electronics would prove a very progressive and motivated company and they opened their first dedicated computer store in 1982, which I assume was the one named Jessa House, 250 Lower High Street, Watford that appeared in advertising at the time. History is blurry but I found a contemporary image of ‘Jessa House’ on some old Watford floppy disks advertised for sale here http://i.imgur.com/JyLzvKt.jpg. 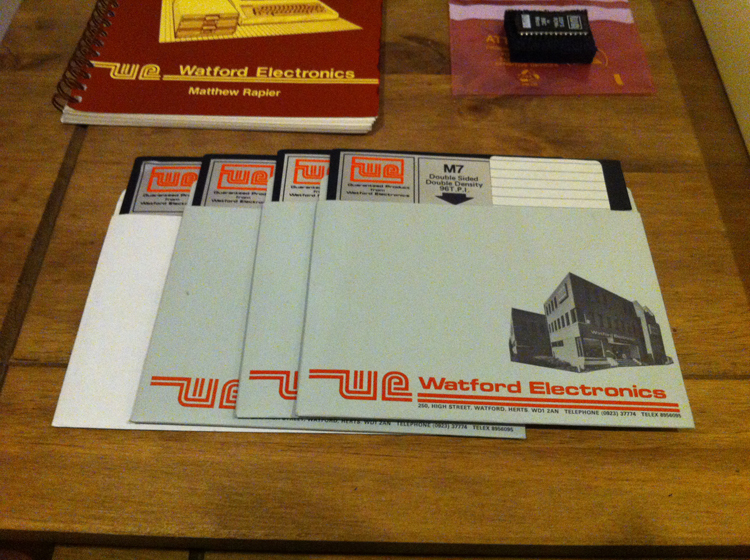 This old Watford catalogue cover turned up at the Centre for Computing History along with a comprehensive list of Watford's software. At the time of writing, this building houses an educational establishment ‘Junior Scholars’, captured on Google Street View here since at least 2008. It turns out the building is just a stone’s throw from WE’s first electronics shop located on Cardiff Road, Watford shown on the ‘78 catalogue above. Remember that home computing was fast becoming a hobby in its own right which rivalled electronics, as reflected by the (our) magazine’s name change from Everyday Electronics to Everyday Electronics and Computer Projects from the May 1983 issue. To be honest, I then completely lost interest in the magazine for a good few years. I wasn’t interested at all in home computing hardware until the early 90s when I bought a PC for use in word processing but not for doing engineering with. Racing ahead, Watford would continue to evolve into a system builder and integrator with their own computer brand: Aries. Online sales were hosted under Watford.co.uk at this time, and their green stripey-bordered adverts were familiar in computer magazines, selling all manner of computing and electronics. The evolving home computer market would become extremely volatile due to razor-thin margins in a volume market. The only way to make money was to shift lots of product, and they faced formidable and ruthless competition from major players such as Dell, HP and Fujitsu who all enjoyed economies of scale. A number of major casualties, PC brands that were very familiar at the time, fell by the wayside. Watford managed to acquire other brands (Carrera for one, and Time and Tiny Computers in 2005). The 2000’s is littered with the names of many defunct system builders and Watford would itself eventually suffer the same fate itself: the market for independent system builders gradually just got eaten away. In 1992 Watford had opened a custom-built HQ and second store in Luton. Watford Electronics would go on to rebrand itself online as Savastore then Saverstore. This Savastore catalogue/ advert from 2004 shows a diverse range of ICT goods for sale - right click and Save As... [download PDF]. Watford's rebranded Saverstore website 2007 [click to see]In the late 90’s Watford had envisaged opening a chain of retail stores including ‘six or seven superstores’, trade sources said at the time. By 2000 Saverstore was turning over £30 million of IT and consumer electronics, but by 2006 the storm clouds were gathering and the system integrator was struggling under some perverse market conditions, no doubt feeling the pressure from large rivals in the PC market who designed and built their own systems. In response, Watford launched a brand called RedTen Internet that offered a PC and broadband/ ISP bundle which trade sources say never reached its potential. In 2007, in a shock move, the Saverstore business was sold, on paper anyway, in a management buyout to Globally Ltd. which had sprung up just a few days earlier at the same address. Mystery surrounded the deal at the time and Globally Ltd. was tight-lipped about the buyout. Records now show a Debenture favouring a likely backer which presumably provided finance to Globally Ltd. secured by the charge over Watford’s assets. In 2008 Globally Limited changed names to Online Distribution Limited t/a Saverstore.com. Trading remained challenging and competition from multinational system builders like Dell and HP must have been intense. Something was afoot when in 2015 a finance arrangement was entered into by way of another Debenture, as recorded at Companies House. The Saverstore website continued until it finally went off air in early 2017. On 17th May 2017 a winding up petition was made against Online Distribution Limited and the firm was finally dissolved altogether on 15th June 2018. This sorry conclusion came nearly half a century after Watford Electronics’ roots were founded as a small mail order supplier of components located in the back streets of Watford, serving amateur constructors nationally during those, the best days of hobby electronics. It was a respected brand offering a good service but, like rival Maplin Electronics, ultimately could not compete with fierce competition, a maturing market and changing buyers' habits. Watford Electronics Limited changed its name to Digital POS Ltd. but at the time of writing Watford Electronics Ltd. appears to have been retained as a separate dormant company. Take a look at BibiMoney, the inventors of Sim-Skin® which aims to streamline payments made using mobile devices. Ex-Watford’s Shiraz Jessa is at the helm as CEO and Shiraz himself appears at https://www.bibimoney.com/team.html. I discovered a worthwhile Crowdfunded project aiming to offer financial resources to the unbanked in Africa via its Sim-Skin technology. Indirectly, the pioneering spirit of Watford Electronics lives on.